AQD took part in the first-ever Pinoy Aquatic Food and Technology Expo organized by the Agri-Aqua Network International (AANI) and held at the AANI Site, Quezon Memorial Circle, Quezon City. The expo, which ran from August 29-31, was a “tiangge”-type affair, showcased agricultural and aquatic products, aquatic farms, aquatic feed and probiotic companies, and aquaculture technologies from AQD and the Bureau of Fisheries and Aquatic Resources (BFAR) regional centers. 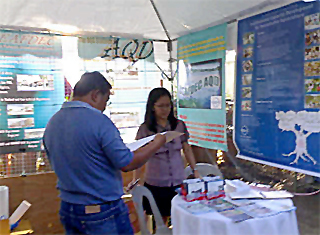 Staff from the Binangonan Freshwater Station and Manila Office took turns in manning AQD’s booth during the activity. Around 85 visitors, mostly first-timers, dropped by the booth and availed of technical advice on mudcrab, seaweed and tilapia farming. About P9,600 worth of AQD publications were sold to the public. The expo gave AQD an opportunity to promote its technologies and programs, especially ABOT AquaNegosyo and ICDSA; advertise training course offerings and provide free technical assistance; and promote extension manuals, especially the new publications.